Israeli Prime Minister Ariel Sharon rose to power as a brilliant military commander and war hero who bulldozed foes. He was one of the chief architects of Israel’s settlement building program in the disputed territories of the West Bank and Gaza Strip. Then, in 2005, Sharon made a surprising and daring maneuver to safeguard the security of Israel and guarantee its survival: He unilaterally dismantled settlements in Gaza, evacuating some 9,000 settlers in a scene of high emotion and impressive military discipline. Months later, Sharon suffered a stroke that left him in a coma. He died Saturday at 85. Sharon never witnessed the terrible unintended consequence of his Gaza move: the rise to political power of Hamas terrorists. But we doubt he would have been surprised. Sharon championed the concept of disengagement and warned of the dangers of Israel overreaching in the disputed territories. In 2005, he told Israelis something that still rings true: Israel could not hold Gaza and every West Bank outpost and still remain a Jewish, democratic state. No Israeli leader has achieved a similarly bold initiative since Sharon’s exit. Sharon’s successor, Ehud Olmert, failed to deliver on a plan to pull out of much of the West Bank, while keeping larger blocs of Israeli settlements there. Prime Minister Benjamin Netanyahu has continued building in West Bank settlements and half-heartedly negotiating with the Palestinians. In recent days U.S. Secretary of State John Kerry wrapped up his 10th trip to the Middle East in pursuit of a peace deal between the Israelis and Palestinians. There’s another deadline that looks increasingly far-fetched: Kerry wants a “framework” deal between the two sides by April. But neither Israel nor the Palestinian leadership seems eager to take a Sharon-sized risk. It’s not hard to see why. The Palestinians can’t unite behind a single political banner, with Fatah and Hamas jockeying for advantage. As long as Hamas terrorists rule Gaza, as long as they refuse to recognize Israel or renounce violence, they hold the power to scuttle any peace deal. For many Israelis, another threat looms more imminent and menacing: a nuclear Iran. What was a troubling rogue program during Sharon’s tenure as prime minister has now mushroomed into a full-blown global nuclear threat. Iran is inches away from the ability to build a nuclear weapon. It has made no secret of its desire to wipe Israel off the face of the Earth. On Sunday, the White House announced that the interim deal to slow Iran’s progress will take effect Jan. 20. Iran promises to start eliminating some of its higher-enriched uranium stockpile. That also starts a six-month clock to reach a final deal to roll back Iran’s nuclear ambitions. The prospects for success don’t seem high. 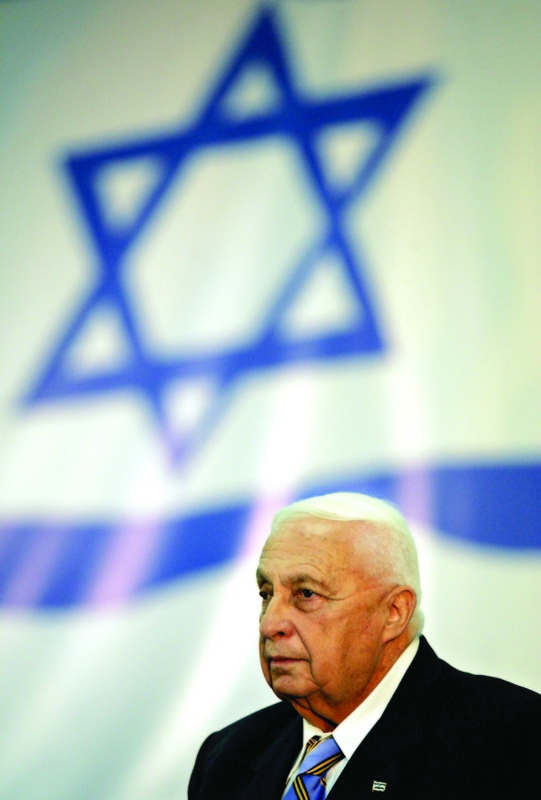 The path to peace, to safeguarding Israel — Sharon’s mission — is as steep as ever.